The PSP Xenon is a full band, dual-stage limiter plug-in (AudioUnit, VST and RTAS for MacOSX UniversalBinary; VST and RTAS for PC) featuring an integrated Leveller, advanced K-System metering and psychoacoustically optimized wordlength reduction. PSP Xenon offers 64-bit precision processing throughout its entire signal path, and can operate at sample rates up to 192kHz. Once you experience for yourself the pristine, transparent response and intuitive design of this plug-in, we believe it will become your "go to" limiter for mastering and other critical audio applications. What do Masters of mastering think about the PSP Xenon? PSP Xenon is brilliant, capable of preserving more of the mix at ghastly levels and pristine when used wisely. PSP Xenon is a very clean, pure-sounding limiter which is also versatile. I have just begun to delve into its more sophisticated functionality, but I have already used it in basic mode on a jazz group and Xenon sounds very transparent to my ears. PSP Xenon sounds great and the pink noise generator linked to the metering is a great tool. PSP Xenon is a unique addition to the world of digital limiters. 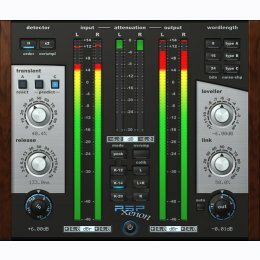 PSP has come up with, in my opinion, one of the most versatile and best-sounding limiter plug-ins available. I find the PSP Xenon a truly remarkable unit which enables the mastering engineer to perform limiting tasks without any compromises.